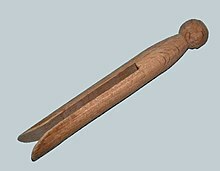 Not to be confused with the one-piece wooden clothes-peg for hanging up coats that was invented by the Shaker community in the 1700s. During the 1700s laundry was hung on bushes, limbs or lines to dry but no clothespins can be found in any painting or prints of the era. The clothespin for hanging up wet laundry only appears in the early 19th century patented by Jérémie Victor Opdebec. This design does not use springs, but is fashioned in one piece, with the two prongs part of the peg chassis with only a small distance between them—this form of peg creates the gripping action due to the two prongs being wedged apart and thus squeezing together in that the prongs want to return to their initial, resting state. This form of peg is often fashioned from plastic, or originally, wood. In England, clothes-peg making used to be a craft associated with the Romani people, commonly know by the slur gypsy, who made clothes-pegs from small, split lengths of willow or ash wood. 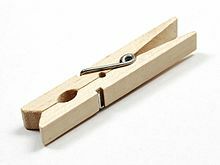 Today, many clothes-pegs (also clothespins) are manufactured very cheaply by creating two interlocking plastic or wooden prongs, in between which is often wedged a small spring. This design was invented by David M. Smith of Springfield, Vermont, in 1853. By a lever action, when the two prongs are pinched at the top of the peg, the prongs open up, and when released, the spring draws the two prongs shut, creating the action necessary for gripping. Smith was also known for being an excellent violin player. It was one of his hobbies. 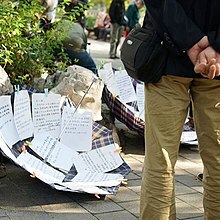 He used to think clearly whenever playing violin, thinking about every day problems. That was how he came up with the idea to invent a clothespin. The design by Smith was improved by Solon E. Moore in 1887. He added what he called a "coiled fulcrum" made from a single wire, this was the spring that held the wooden pieces together, acted as a spring forcing them to shut, and as a fulcrum on which the two halves could rock, eliminating the need for a separate component, and reducing manufacturing costs. This became the first successful spring-actuated clothespin, being manufactured and sold in huge quantities all across the United States. The state of Vermont, and its capitol of Montpelier, in particular, quickly became what The New York Times has called "The Silicon Valley of Clothespin Manufacturing", the United States Clothespin Company opening in 1887 to manufacture Moore's improved design. Vermonter Stephen Thomas, a Medal of Honor recipient in the Civil War served as company president, and the company enjoyed a significant level of success, in spite of the competitors that rapidly sprang up in Waterbury and other places. Most significant was in 1909, when Allan Moore, one of the U.S.C. Co. employees, devised a way in which clothespins could be manufactured more cheaply, by eliminating one of the coils in the "spring fulcrum". He left the company, and with a loan from a local entrepreneur opened a competing factory, literally across the street from the U.S.C. Co. building. The new National Clothespin Company rapidly overtook the U.S.C. Co., consuming 500,000 board-feet of lumber at the height of production. After WWI, cheap imports from Europe began to flood the market, in spite of repeated calls for protective tariffs by Vermont, and the state industry went into decline; in 1920, it cost 58 cents to manufacture one gross of clothespins in Vermont, while imported Swedish clothespins were sold for 48 cents a gross. The situation worsened after WWII, and the introduction of the electric clothes dryer diminished demand for clothes pins, further damaging the industry; the U.S.C. Co. was forced to close its doors before the end of the 1940s. However, the National Clothespin Company, who had previously moved from its original location across the street, and had been sold to a new owner, managed to stay in business by virtue of a contract with the F.W. Woolworths department store chain. In this fashion, they managed to hang on through the following decades, in spite of a disastrous fire in 1978. The profit margin was eaten into further by the increasing volume cheap Chinese imports; the familiar pleas for protective tariffs were continued, but to no result. The company, which had discontinued its line of wooden clothespins, diversified into plastics, including plastic clothespins, which constituted only a small part of overall production. However, the National Clothespin Company finally ceased production of clothespins, the last American-manufactured clothespin coming off the production line in 2009, amid a certain amount of media attention and regret. Clothespins were further enhanced by the invention of stainless steel clothespins that do not rust or decay with outdoor use. Rather than using a torsion spring that often twists, causing the clothespin to fall apart, they rely on a strong, trapped, compression spring that results in a stronger grip. One famous clothespin is a sculpture by Claes Oldenburg, entitled Clothespin. It is in Philadelphia across the street from the City Hall, and can be seen in the movie Trading Places. There is a 5-foot clothespin granite grave marker in the Middlesex, Vermont cemetery, marking the grave of Jack Crowell, the last owner of the National Clothespin Company, which was the last clothespin manufacturer in the United States (see above). He originally requested that it include a working spring be included so children could play on it, but the stone workers convinced him it wasn't feasible. During the production of a movie, commercial, music video etc., a spring-type clothespin is called a "CP 47", "C47", "47", "peg", "ammo", or "bullet". It is most useful on the set since lights used on film sets quickly become far too hot to touch; a wooden C47 is used to attach a color correction gel or diffusion to the barn doors on a light. The wooden clothespins do not transmit heat very effectively, and therefore are safe to touch, even when attached to hot lights for a significant period of time. Plastic clothespins are not used as plastic would melt with the heat of the lights, and metal would transfer the heat, making the clothespin too hot to touch. People like gaffers, grips, electricians, and production assistants may keep a collection of C47s clipped to clothing or utility belt at all times. Hence the nickname "bullet", as so many crew members clip a number of C47s to their utility belts, much like an old west gunslinger would carry extra cartridges (which are often inaccurately referred to as bullets) on his gun belt. When a performer is in full makeup they sometimes cannot drink from a cup so they drink from a straw. When the bottle or cup is too deep for the straw a C47 is clipped an inch from the top of the straw to keep the straw from falling into the drink. In Lutherie, clothes-pegs are often used to glue on kerfing during the production of guitars, mandolins, and other stringed instruments. Since multiple RC frequency use began in the RC hobbies in the mid-20th century, so-called "frequency pins" have been used to ensure that only one modeler was using a particular frequency at any one time. The common, spring-loaded two-piece wood clothespin - marked in some manner with text and/or color-coding for the designated frequency it references, usually with an added piece of thin plywood or plastic on the clothespin to place the text or color-code upon for greater visibility - is the usual basis for these, whether the model club itself provides them already clipped onto a "frequency control board" for the modeler to take for their activity (clipped onto their transmitter's antenna, in a so-called "subtractive" method) or the modeler make them for their own transmitter(s), and places them on a club facility's existing frequency board (the "additive" method). ^ "Crafts". Merl.org.uk. Retrieved 2014-07-15. ^ a b Greenbaum, Hilary; Charles Wilson (May 11, 2012). "Who Made That Clothespin?". The New York Times Magazine. Retrieved May 11, 2012. The first design that resembles the modern clothespin was patented in 1853 by David M. Smith, a prolific Vermont inventor. ^ Lahey, Anita (Fall 2006). "The Better Clothespin". American Heritage of Invention & Technology. 22 (2). Archived from the original on January 19, 2010. Retrieved August 11, 2015. ^ a b "Businesses put the pinch on others : Times Argus Online". www.timesargus.com. Retrieved 2016-03-17. ^ Alice L. George (2006). Philadelphia: A Pictorial Celebration. Sterling Publishing Company, Inc. p. 112. ISBN 1-4027-2384-9. ^ Box, Harry (1993). Set Lighting Technician's Handbook (1st ed.). Focal Press. pp. 141, 347, 349. ISBN 0-240-80161-X. ^ Rahmel, Dan (2004). Nuts and Bolts Filmmaking: Practical Techniques for the Guerilla Filmmaker. Focal Press. p. 196. ISBN 0-240-80546-1. ^ "The Body". Rosenbladt-guitars.com. Retrieved 2014-07-15. ^ "Luthiery". Norse Woodsmith. Retrieved 2014-07-15. ^ "Operation of Radio Control Flying Sites - Frequency Control of Non-2.4 GHz Spread Spectrum R/C Radio Systems" (PDF). modelaircraft.org. Academy of Model Aeronautics. December 18, 2014. Retrieved May 25, 2015. Use of frequency pins to identify the frequency in use. Pins, often clothespins, are marked with the color or channel number of the frequencies they represent. Only one pin is available at the flying site for each frequency. Transmitters shall not be operated without possession of a pin that identifies the frequency in use. 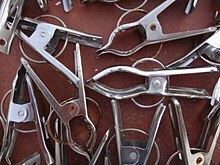 Wikimedia Commons has media related to Clothes pegs. Look up clothespin in Wiktionary, the free dictionary. This page was last edited on 13 April 2019, at 07:57 (UTC).